Vermont EPSCoR (Established Program to Stimulate Competitive Research) has been supporting research at Vermont's colleges and universities with funds from the National Science Foundation and local sources since 1986. The impact of the EPSCoR program also includes the private sector – particularly small, technology-based businesses. 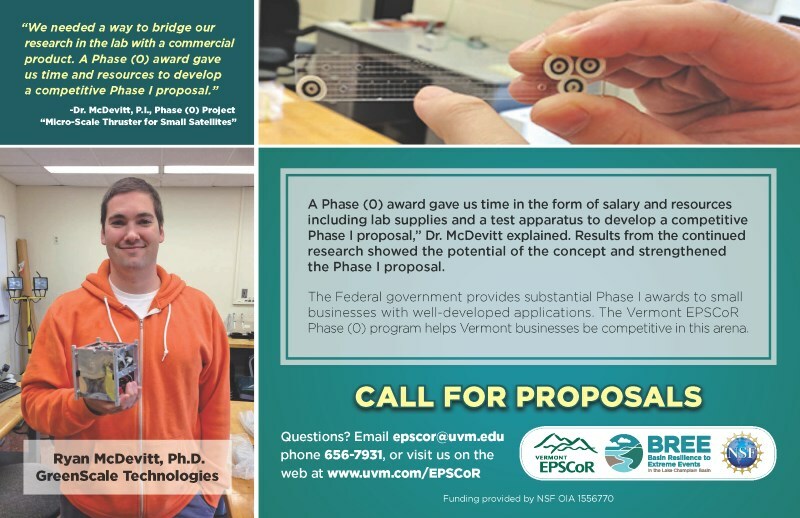 Vermont EPSCoR will once again provide the opportunity for Vermont small businesses to compete for grants to foster research and development projects which will lead to application to federal Small Business Innovation Research (SBIR) programs. One award will also be made in areas of interest to NASA using NASA-EPSCoR funds (contingent upon availability of FY19 NASA funds). To show that an area is of interest to NASA, the PI should identify their proposed project with a new or continuing NASA research priority or technology need. This can be done by reference to a URL on a NASA website or by including an email of support from a NASA contact. The project has to include a full-time faculty researcher at a Vermont college or university as a collaborator. Only NASA projects carry this requirement. The maximum amount of each grant is $15,000. Multiple year Vermont EPSCoR Phase (0) awardees must take a 1 year break from submission after their third consecutive successful award. Awards contingent upon NSF funding for Vermont EPSCoR. Funding may not be used to support Master's Students’ salaries.